Yeah, foam is a crazy new fad. Afterall, no chef was making any food with “foam” ten or 50 years ago. Right? Well, no. Wrong. Foam in cooking, baking and beverages is everywhere. Sometimes it is obvious like a nice froth on a cappuccino. Other times, like in this dessert, it’s a bit less recognizable. This dessert (part 2 of my French Laundry meal) is composed of several foams. Five types to be precise. 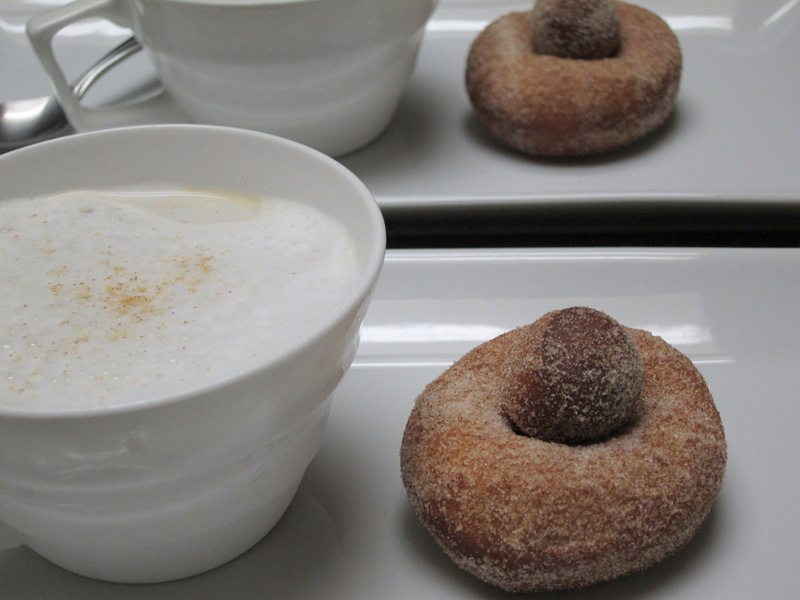 As the name suggest and the picture shows this is a sort of coffee with a nice froth on it served alongside some perfect donuts. This is a classic French Laundry dessert that is much more than it seems. The coffee part is actually a coffee semifreddo topped with steamed frothy milk to give it a traditional cappuccino look. Semifreddo literally means semi-frozen or half frozen and it is a very traditional Italian dessert made by mixing three foams. A custard foam made from egg yolks, sugar and flavored with instant espresso powder is mixed with stiff-whipped sweetened cream and a simple meringue (whipped egg whites and sugar). The three are gently folded together and portioned out into small coffee cups and then frozen. 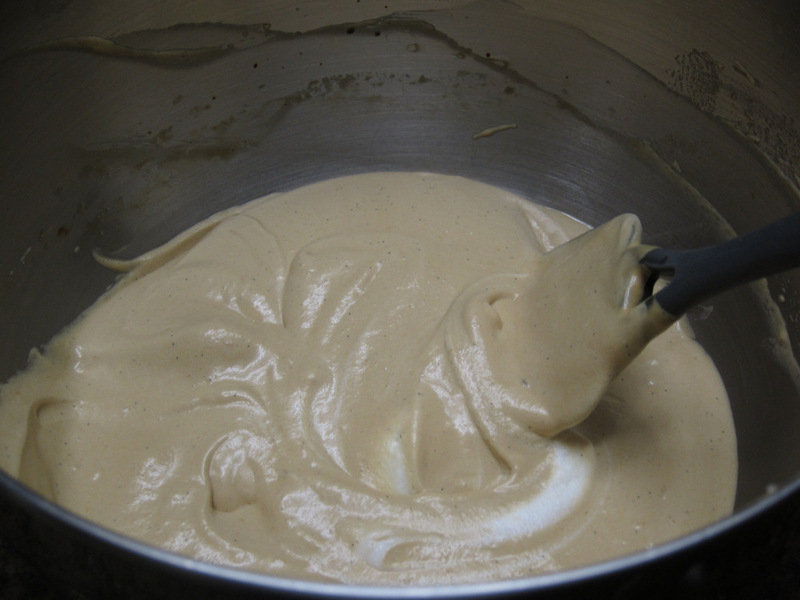 The frozen product has a wonderful smooth rich texture similar to frozen mousse. 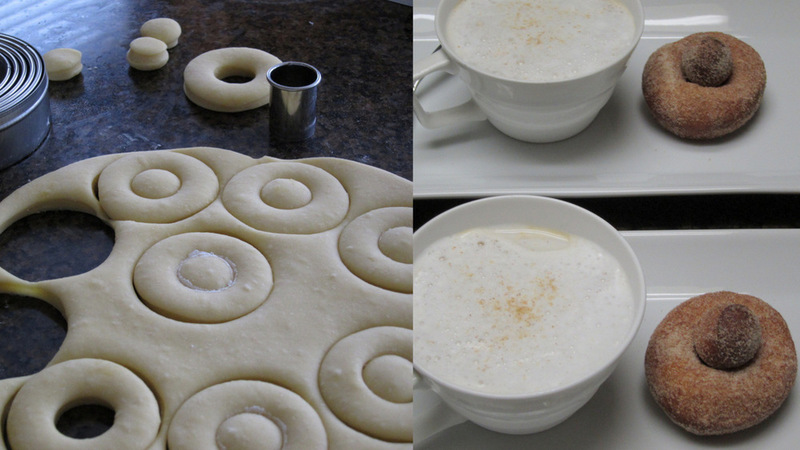 It is allowed to warm up for a few minutes and then it is topped with hot frothy milk. The effect is both lovely to look at and just delicious with the fantastic juxtaposition of hot and cold. Bread and cakes are filled with air bubbles. They are also a type of foam that we bake, steam or fry to trap those air bubbles. As the air in those bubbles heats up it expands producing airy products that are at the same time light and sturdy. These donuts belong to the category of yeast-risen doughs as opposed to cake donuts which are a quick bread leavened chemically with baking soda and baking powder. 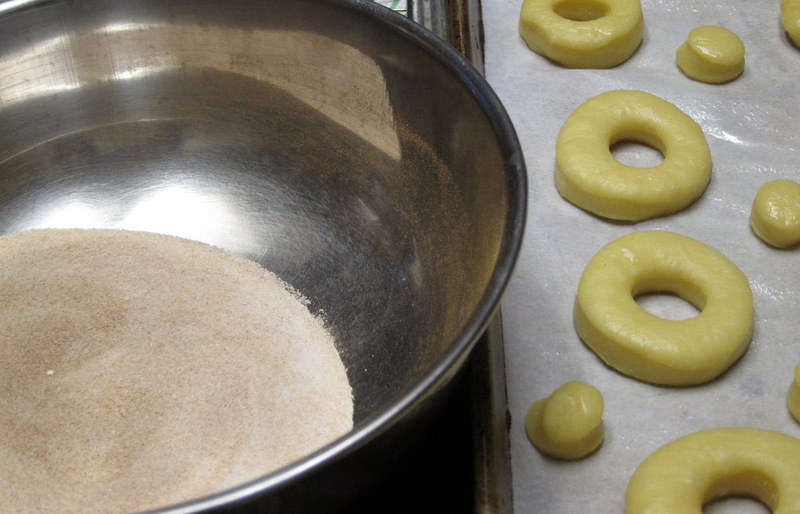 Chef Keller’s donuts are rich and almost like a brioche dough. they are made with flour, sugar, eggs and butter. After I made the dough I put it in the fridge to allow it to rise slowly and develop flavor. A couple of hours before frying, I rolled the dough and cut it into 2-inch rounds and then used a much smaller round cutter and punched holes in those rounds to get both donuts and donut holes. When ready to serve, I fried the donuts and holes. It’s really neat seeing them go in the oil then bob up when they puff with the heat. 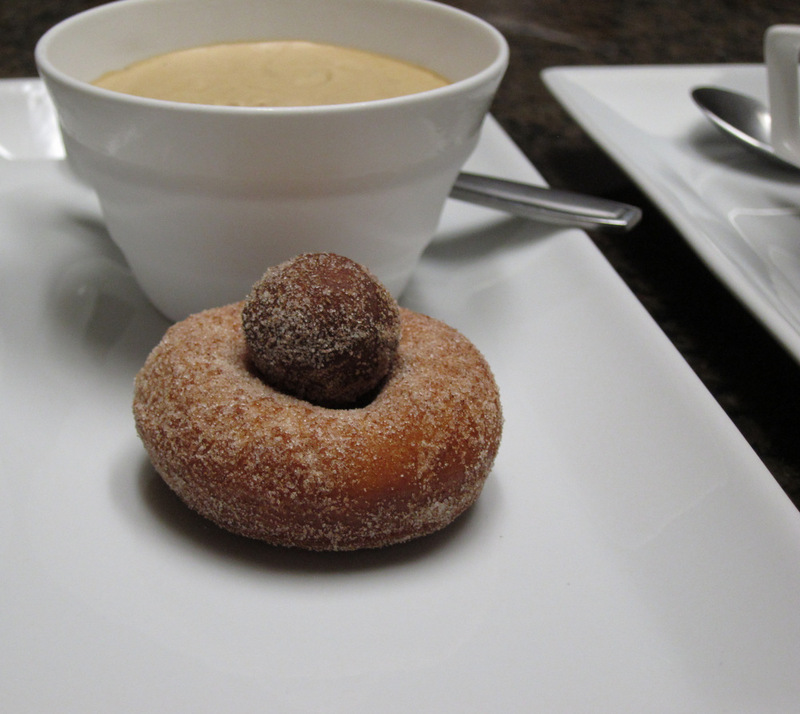 While they are still hot, I rolled them in a mixture of cinnamon and sugar and plated a donut and a donut hole alongside the “coffee”. The combination, just like the braised pork cheek dish that preceded it, is comforting, familiar and refined. The semifreddo gets soft enough to even dunk the donuts in it. I highly recommend you do that if you decide to try making this. The recipe makes a good bit of donuts and that’s a good thing because one is not enough.